In a Tip post earlier this year, 5 Customer Service Don’ts, I wrote about a horrible customer service experience with my home alarm monitoring company. Another recent experience has prompted me to return to this topic again—this time in relation to the difficulty of reaching a live person at Amazon.com for immediate assistance. Let me start by saying that once I actually got to a person I received phenomenal service and my problem was quickly and easily resolved with a solution that exceeded my expectations. My issue stems from the trouble I had figuring out exactly how to start that conversation. I ordered a gift from Amazon.com that was to be delivered the day before I needed to give it to an out-of-town visitor. The package arrived on time, but the box was in sad shape and one component of the gift was damaged. I didn’t have time to return the entire item for a replacement, so I figured that I could present it as is, and have a replacement part shipped directly to the gift recipient’s house. 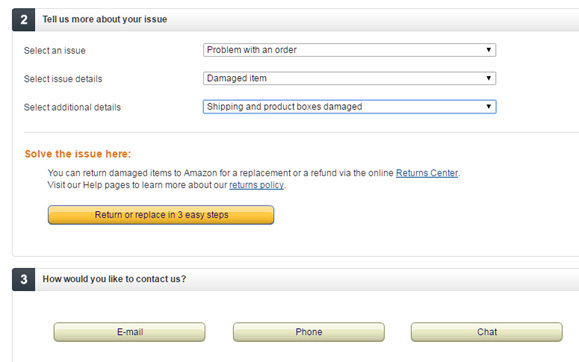 I went to the Amazon website, located the Order, and then tried to figure out how to request the replacement part. The only option on the Order screen was a “Return/Replace” button that enabled me to return the item for a full replacement or refund– not what I wanted to do. Additionally, I was unable to locate a Chat button or phone number anywhere. Being a slightly savvy Internet shopper, I went to the site footer to look for a Help or Contact Us link. I couldn’t find “Contact Us,” but did find “Help” which brought me to another page where I could (among other online options) begin the return/replacement process. At that point it seemed Amazon really didn’t want to deal with me in person. So, I started down the return/replace path to see if it might lead to the ability to get a replacement part. But, it did not. The only option I had was a full return for refund or replacement option. So I tried the footer link for “Returns/Replacements” which lead me to the “Returns Center” that had a tiny link at the bottom which read, “For detailed information on return policy see Returns & Refunds.” On that page, when you scrolled all the way to the end there was a “Contact Us” button at the bottom of the left column. Clicking that button enabled me to select the Order in question, and then report that I wanted to contact them about a problem with the order related to a damaged item. Note that up until I selected the exact problem, in the third drop-down box, there was no indication that I could get in touch with an actual person. I chose the Chat option, and got to a person in about a minute. I explained the problem, and was immediately offered a replacement without having to return the original. The replacement would be shipped directly to the gift recipient’s home, and I could give the damaged item while he was visiting and let him know that a new one would be waiting when he got home. All I had asked for was a replacement part, and the solution offered was far better than I expected. All of this left me wondering why Amazon makes it so difficult to get to their customer service team. By my count it took some guesswork, 3 screens and 8 clicks to get to the live Chat. Use https://www.amazon.com/gp/help/customer/contact-us to go directly to the Amazon Contact Us screen and start a Chat or get the customer service phone number. PaySimple takes the complete opposite approach. We put customer service front and center with our phone number in our website header and a Chat button that pops up on every page. 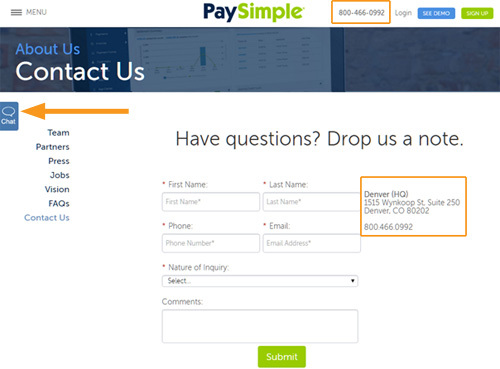 While logged into the PaySimple system, our customers have self-service options (watch for our soon-to-be-released new and improved Support Center and Knowledgebase), access to live Chat during business hours, the ability to submit a case directly to the support team, and of course the option to call or email our award-winning Customer Care team at any time. We even provide our street address in case you want to drop us a note in the mail. If you do call our Customer Care team, they’ll greet you by asking, “How can I make your life easier today?” It’s a sentiment the team, and our entire company, truly embraces. PaySimple is a payment processing software provider to the small business market, so it makes sense that we make top-quality service our top priority. But, what about large online retailers like Amazon? Is my Amazon experience typical, better than average or worse than average? To find out, I did an informal survey of the top 10 shopping sites (as determined by Alexa on the day I wrote this) to see how easy (or hard) it was to get to a live person for support. Ebay: 2 screens and 8 clicks to get a telephone number you can call during business hours. Netflix makes it easy with a Help link on the homepage. Not only do they provide a phone number and Chat button at the bottom of every help screen, they also provide wait time. If you’re logged in, you’ll get a phone code to use that will provide the person answering your call with immediate access to your account details. For an inquiry related to an online order, Walmart.com provides Chat and Phone support during its business hours. Target helpfully puts a “contact us” link in their footer. The Contact Us page includes phone numbers dedicated to various issues. Select “Other” or any topic related to shopping, and you’ll get a contact form as well as a live Chat box. You can submit the form, chat, or call as you wish. If you need to contact them about an order, the help screen provides a phone number. If you need help with anything but placing an order or inquiring about an existing order, you are out of luck. You can send an email, with no attachments, and they will get back to you in 3-5 business days. The site footer includes a phone number. When you click to the Help screen you also get the option to call, email, or chat (look for the Chat button at the far-right of the screen). But you need to work to find them. The Customer Service link is in tiny print in the site footer, and the customer service phone number is at the very bottom of a self-service oriented page. No Chat option, but email is available. So, based on the above it seems Amazon live help is more difficult to locate than the other large online retailers, though that of course is no indication of whether the level of service is better or worse from companies where it is easier to reach a service representative. It also appears that while all of these companies will eventually provide phone access, only 5 provide Chat; and of those Amazon is the only one that does not highlight the Chat option. While you can’t conclude much of anything from my little informal assessment, I think it makes clear that when live help is easy to find, it is very easy to find; and when it is buried it is well-buried. And in the case of Amazon, it is worth your time to seek it out. The Microsoft 2015 Global State of Multichannel Customer Service Report found that while 90% of consumers expect to be able to access an online self-service support solution, only 57% of US respondents began their customer service interaction online, and only 5% actually prefer using online self-service support. The preferred support channels for US Consumers were telephone (36%) and Chat (33%). The study authors hypothesized that this preference was due to the ability a live agent has to solve complex and individualized problems that an online system may not adequately address. And, if you’re still thinking that providing the best possible customer service experience isn’t all that important, think again. A recent Zendesk study, summarized in this infographic, found that 39% of all respondents, 45% of women, 51% of B2B customers, 54% of Gen Xers, and 79% of high-income households, will actively avoid a business for 2 or more years after a poor customer service experience. If there is any one lesson from this that you should take to heart for your small business, it is that you need to know your customers and to provide service to them in the ways that they want. If you can’t afford to provide fantastic self-service, phone, email and Chat solutions; figure out the channels that a majority of your customers prefer and concentrate on those. And, whichever options you choose—don’t hide them!